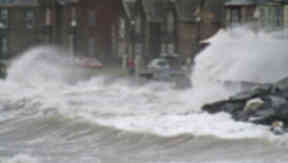 Coastal flooding has been reported across a large part of Scotland on Friday amid the severe weather. A surge of stormy weather, including gale-force winds and heavy rainfall, has caused traffic disruption and flooding across Scotland. Coastal flooding has hit several locations on the west coast of Scotland with roads and rail lines affected. The A78 was closed in both directions between Stevenston and Kilwinning in Ayrshire, as well as between Skelmorlie and Largs because of flooding. Millport on the Isle of Cumbrae and a large part of Largs was flooded, while Helensburgh in Argyll was also affected. Traffic Scotland closed the Forth Road Bridge to high-sided vehicles and imposed a 40mph speed limit on Friday morning. Road users on the Clackmannanshire Bridge and the Friarton Bridge in Perth were also advised to exercise caution because of the high winds in the region. 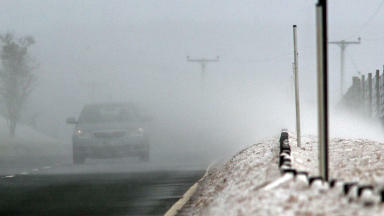 The A78 was closed in both directions between Stevenston and Kilwinning, and between Skelmorlie and Largs. The A75 in Dumfriesshire was closed for several hours at Carrutherstown after a HGV overturned in the high winds. It was closed by police in both directions as vehicle recovery took place, while a diversion via Carrutherstown village on the U102 road was implemented. 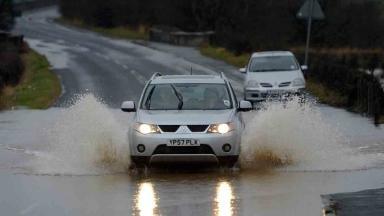 The A781 White Sands in Dumfries was also closed due to flooding between A780 Buccleuch Street and Dockhead. 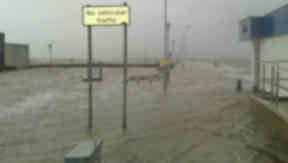 Elsewhere in Dumfries and Galloway, the Kelton to Glencaple road was blocked, while Annan Harbour area was flooded. Police Scotland also reported flooding on the A747 between Glenluce and Port William, and at Carsethorn, Powfoot and Newbie. Environment Minister Paul Wheelhouse urged members of the public to remain vigilant about flooding. He said: "Preparedness for flooding events such as those experienced by Scottish communities in the past week is key. I have seen from Police Scotland cameras that emergency responders are working extremely hard in locations around the country to provide a co-ordinated response to these difficult conditions. "I’d like to pay tribute to the dedicated efforts of all the agencies involved in tackling flooding. Today at the Police Scotland communications centre, I’ve seen the heart of the response on the west coast. The council, local fire and rescue service and other emergency services are ready to react swiftly to minimise the impact of flooding. "Keeping up-to-date with the latest information is crucial to communities vulnerable to flooding. I’d encourage everyone to regularly check with the Sepa Floodline website for updates and warnings. Users can also sign up to receive Floodline warnings directly to their mobile phone." Yellow warnings for severe weather across most of Scotland was put in place by the Met Office for the whole of Friday, which is expected to bring heavy rain with more than 20mm across a lot of the country. Traffic Scotland advised motorists in the Strathclyde, Lothian and Borders and Dumfries and Galloway areas to exercise "extra caution" on the roads. It stated: "If you are travelling you should ensure you and your vehicle are adequately prepared for the conditions making sure you have sufficient fuel and supplies such as warm clothing, food and water in the event you are delayed for several hours. Charge your mobile phone and plan your route as well as alternative routes." Virgin and Transpennine train services between Glasgow and Carlisle were affected on Friday because of overhead line problems brought by the weather at Lockerbie. In the Western Isles flooding closed sections of Stornoway town centre, the Baleshare causeway in Uist, and also the road between Eoligarry and the airport terminal on Barra. Several ferry services were impacted on Friday morning as a result of the severe weather, including P&O cancelling some services between Larne and Cairnryan, as well as sailings to and from Troon. Argyll Ferries suspended its Gourock to Dunoon services, while the Kilcreggan ferry took the same step as high winds and rainfall hit the Firth of Clyde. Caledonian MacBrayne saw several services disrupted by the weather, including ferries to Arran and Barra. The Scottish Environmental Protection Agency (Sepa) put in place 37 flood warnings across the country, including for a large part of Perthshire, areas in West Dunbartonshire, Inverclyde and Renfrewshire. Rainfall was predicted to cause flooding in Troon, Prestwick and Largs in Ayrshire, as well as on Arran, while Sepa has put in place warnings over coastal flooding in Helensburgh and Lochgilphead in Argyll and Bute. Fort William and the nearby village of Caol in the Highlands are also the subject of a Sepa flood alert. 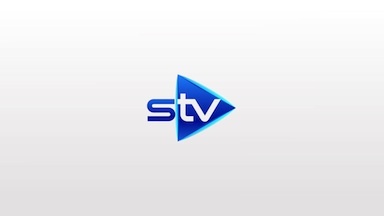 STV weather forecaster Jo Farrow said: "As people return to work tomorrow and school on Monday, there are going to be some tricky conditions on the roads as well as on the ferries. "There will be heavy rain and severe gales in the west on Friday and further spells of heavy rain and strong winds for the end of the weekend. There is unlikely to be any let-up into next week."